pointfig is updated to accept data input as a matrix, timetable, or table. 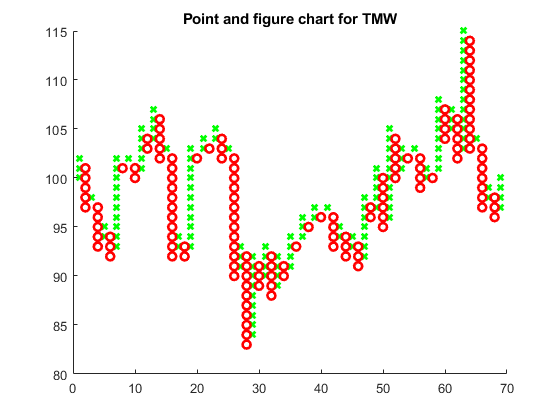 pointfig(Data) plots a point and figure chart from a series of prices of a security. Upward price movements are plotted as X's and downward price movements are plotted as O's. h = pointfig(ax,Data) adds an optional argument for ax. Load the file SimulatedStock.mat, which provides a timetable (TMW) for financial data for TMW stock. This Point and Figure chart is for closing prices of the stock TMW for the most recent 21 days. Note that the variable name of asset price is be renamed to 'Price' (case insensitive). Data for a series of prices, specified as a matrix, table, or timetable. Timetables and tables with M rows must contain a variable named 'Price' (case insensitive). (Optional) Valid axis object, specified as an axes object. The point and figure plot is created in the axes specified by ax instead of in the current axes (ax = gca). The option ax can precede any of the input argument combinations.